Easy Scholarships! 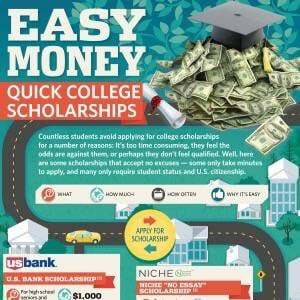 Quick College Cash Find easy scholarships to pay for college! We also have 20 featured scholarships for military veterans. You may also enjoy our top list featuring the top 50 scholarships for online students! Our resource guide to finding and applying for scholarships may also help you find easy scholarships. Countless students avoid applying for college scholarships for a number of reasons: It’s too time consuming, they feel the odds are against them, or perhaps they don’t feel qualified. Well, here are some easy scholarships that accept no excuses — some only take minutes to apply, and many only require student status and U.S. citizenship. Why it’s easy: Applications require only basic information and are drawn at random. Why it’s an easy scholarship: Applications are simple and you can apply every month. Why it’s easy: The application involves basic information and a very short essay answer to a weekly-changing question. Why it’s an easy scholarship: The application is nothing but 15 questions about yourself. Why it’s easy: Applications involve a short survey and an answer to a prompt in 400 to 600 words. Why it’s an easy scholarship: Applicants must simply have the required GPA and be a U.S. citizen. Why it’s easy: Three original, unpublished haikus are all that is needed to apply. Why it’s easy: Applicants must submit two short essays: one about travel and the other about deserving the scholarship. Why it’s easy: Applicants just have to read an essay about automatic fire sprinklers and then take a test online. Why it’s an easy scholarship: Applicants just need to submit SAT/ACT scores and an essay on unions. Why it’s easy: All that applicants need to do is write a 500-word essay about the future of banking. Why it’s an easy scholarship: Applicants must develop an action plan for a perceived need in their community. Why it’s easy: When signing up for Potential Magazine’s online newsletter, students are automatically entered to win the scholarship. Why it’s easy: Upon taking the PSAT exam, students must simply indicate on the test answer sheet that they wish to compete for this scholarship. Myth #1: Billions of scholarship money goes unclaimed each year. The truth: Employer-paid education benefits are included in the “billions” of unclaimed scholarship money and account for about 85% of it. So in truth, the number of unclaimed dollars is much lower. Myth #2: The competition for scholarships is too stiff. The truth: If you look hard enough, you can find easy scholarships requiring your specific talents or ideas. Not all are aimed at the student with the best high school GPA or the most community service hours. Myth #3: Only the best students receive undergraduate scholarships. The truth: Scholarships tend to honor those of specific majors and interests, as many universities offer full rides to students who have performed outstandingly in high school. Myth #4: I’m a good student, so the scholarship offers will come to me. The truth: This one is simple: If you don’t put forth the effort, you won’t reap the benefits. Scholarship agencies don’t search for students. They only look at applicants. Myth #5: Applying for a loan will lessen my chances of getting a scholarship. The truth: Every school is different, but most offer scholarships before loans can be taken out. And even if they don’t, necessary loans should not affect scholarship amounts. Myth #6: Student scholarships require sensational talent. The truth: As you’ve seen above, this just isn’t true. Many easy scholarships are random and based on luck, while others require simple essays about why you deserve the money.